In recent years, Frito-Lay has experimented with the flavors of its iconic Lay’s potato chips, giving consumers the chance to weigh in on what outlandish flavors — cappuccino, wasabi ginger, bacon mac and cheese — should be added to the company’s lineup for a limited time. More recently, the company has revamped its popular BBQ Lay’s — somehow adding a “burst of flavor.” And, in an attempt to entice customers to try the re-flavored snack, the company offered customers a coupon for a free bag of chips. Except, by the time the mailed coupons arrived, they were expired. Consumerist reader B. brought the issue to our attention this week, pointing to a Facebook post by Lay’s promoting the new “more flavorful” BBQ chips and offering a free bag. 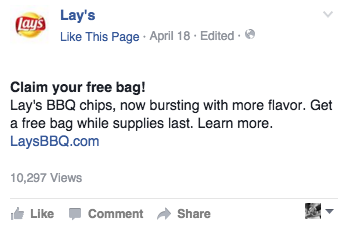 In the April 18 post, which includes a video, Lay’s says its new BBQ chips are “bursting with more flavor,” urging customers to “get a free bag while they last” with a link directing customers to enter their information and receive a coupon for a free sample bag. While the link no longer allows customer to enter their information, stating that “sorry, all samples have been claimed,” Facebook users who commented on the post say they were told the coupon would be mailed to them. Starting this week, customers began commenting that they had finally received that coupon, only to find it had expired days before arriving. We reached out to Frito Lay for comment on the expired coupons on Wednesday, but have not heard back. We’ll update this post when we do. However, it appears that the company has started to reply to customers who received the expired coupons, apologizing for the issue and saying a new coupon would be sent in a few weeks. The company offered several similar replies to customers commenting on the post. It’s unclear when the newly issued coupons will expire. The company also responded to the complaints posted on Twitter.